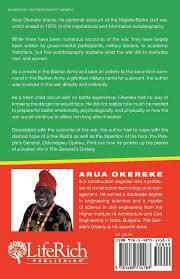 Now out is this rich book titled, The General’s Orderly by Arua Okereke. The book is about the true life story of a boy of seven who was born born into a barely comfortable polygamous family, being of the Ehugbo stock that practices a matrilineal system of inheritance, and of course, as is typical of an ambitious Igbo boy, he was happy to leave home for Southern Cameroon with his maternal uncle in search for greener pasture. This search would finally see him dwelling in various settings and across many seas away from home to achieve his goals. barely armed, barely trained child soldier fighting in the frontlines of the Nigeria-Biafra civil war. It spoke of the remote and immediate causes of that war and its long term consequences on the people. It also gave exciting accounts of the experience: the fight, the escapes, and an eventual surrender. It also goes around many firsts and of successes of an exceptionally gifted child who loved education, inventions, sport; and who always came tops in class all through to his doctorate award bagged in 1987. A boy saved from more perilous war circumstances to become orderly to a General, the second-in-command of a rebel group. A boy now a grandfather, who came small in size, but activist in nature to achieve greatness for himself and family name; and to establish precedents that encourage others. A boy fated to be lucky; winning lotteries and opportunities, gaining support and mentoring every step of the way to see him through life itself and its many hurdles. of a young man’s evergreen experiences with a Grace who suddenly was no longer reachable and whose unknown whereabouts till date leaves a gap in his mind, that only she can fill. The story went forward to show the inter-racial meeting, falling in love and marriage in Bulgaria to Vanya Dimitrova that helped stabilize the young man’s focus, and of the family they built together. traditional settings, local and tribal politics. The story also brought to light the many rots in the ivory tower, and the spiritual powers inherent in man. just worth reading but captivating to the very last page.